KIEV, Ukraine -- Ukraine's opposition claimed serious irregularities in Sunday's local elections, which are seen as an important test of President Viktor Yanukovych's commitment to democratic freedoms. A boy holds a ballot paper during voting in Brovary. The vote, the first since Yanukovych was elected in February, is being closely followed in the West due to concerns over restrictions on democratic rights under the new government. "There are sufficient reasons to recognise that the local elections are invalid in many areas," Olexander Turchynov, a key ally of former prime minister Yulia Tymoshenko, said in a statement. According to Turchynov, there were serious concerns over voting irregularities in the regions including Kiev, Luhansk and Lviv. 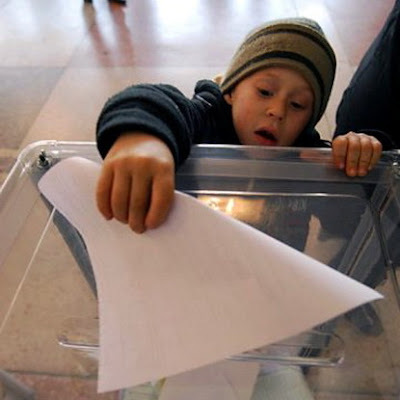 Turchynov pointed to unusually high levels of postal voting and voting in hospitals, as well as generally poor organisation that prevented people from casting their ballots. In an ill-tempered campaign, the opposition led by Tymoshenko has accused the president of planning to manipulate the results in favour of his Regions Party, while the authorities in turn have accused the opposition of "provocation." US Vice President Joe Biden highlighted the "importance of free and fair elections on October 31 and media freedom" in a recent phone call with Yanukovych. Opposition candidates have been targeted in criminal probes, a printing house was discovered to have printed extra ballot papers and the electoral commissions are dominated by members of Yanukovych's party. "In the regions, the officials understand that they risk losing their jobs if they do not ensure a good result for the party of power and they are trying to do their best," said independent political analyst Volodymyr Fesenko. The presidency rejects these accusations. "There are no systematic violations," the head of the presidential administration, Sergiy Lyovochkin said Friday, adding that Yanukovych had ordered the authorities to ensure the vote was "free and fair." Around 2,400 observers were following the election, among them 500 international observers. Polling stations closed at 2000 GMT. Three hours after they opened, observers, parties and police reported dozens of minor violations. In 2004, popular protests that came to be dubbed the Orange Revolution led to the reversal of a rigged election which had been claimed as a victory for Yanukovych. Fresh polls elected pro-Western politician Viktor Yushchenko, then an ally of Tymoshenko. Yushchenko's term of office in 2005 to 2010 was chaotic and marked by political wrangles but saw unprecedented respect for democratic rights. Ironically, the president was ignominiously voted out in January, while Yanukovych made a comeback in a tense presidential race. Electors were voting to choose mayors and local and regional assembly members. Following traditional allegiances, the Russian-speaking east and south of the country were expected to vote for Yanukovych's Regions Party, while the Ukrainian-speaking west was expected to back pro-Western parties. Experts predicted a poor showing for the bloc of Tymoshenko, who is now in the opposition after losing the presidential election to Yanukovych. Tymoshenko garnered 45 percent of votes in the presidential elections but her party was expected to scrape only 12 percent on Sunday, versus 30 percent for the Regions Party, according to a recent poll.